A teacher's desk should accommodate the teacher's comfort level and organizational needs. Before you invest in a new desk, think about its style, material and features; this will ensure you find the best desk for your space. Single-pedestal desks have one column of drawers attached to the fame. These desks are more compact than double-pedestal desks, but have less storage. They are typically not height-adjustable. Double-pedestal desks have two columns of drawers attached to the frame. While these desks are often large and great for storage, they can be hard to move and are typically not height-adjustable. 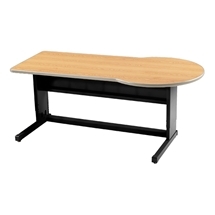 Desks with no pedestal have no attached columns of storage. These desks are more often height-adjustable and mobile. They may or may not have a modesty panel. 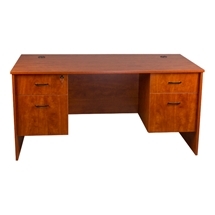 Most teacher's desks are a combination of laminate, wood and steel. Laminate is generally affordable, lightweight and easy to clean, while wood is durable and classic looking. Steel is exceedingly strong and can last for decades. If you know your desk will be exposed to food, art supplies and other messy materials, laminate and steel is your best bet – these materials can better withstand spills and nicks and scratches. If you plan on changing the layout of your classroom frequently, or need a desk that can quickly move from room to room, opt for heavy-duty locking casters. Consider a central locking system – that is, a system that locks every drawer at once – if you feel theft or vandalism might be an issue. If you have a computer, iPads, phones or other electronic devices to store at your desk, choose a piece with multiple grommets to keep wires organized and out of sight.